Weighing in as a historian, because there seems to be some confusion about this. Of course you are ALLOWED to grieve Notre Dame. No one is stopping you. But maybe leave room for empathy for entire cultures that have been decimated by France/Catholicism, too. Ask yourself, why is it that the fire in Al Aqsa Mosque did not garner so much attention? Why is it that historic Black churches in Louisiana are not treated like priceless cultural relics? Why were you (probably) not taught their histories in school? Why do we have so much documentation of Notre Dame, meanwhile we buried a freedmens cemetary under a gas station? I want to talk about the millenial burnout article through the lens of disability and chronic illness. I think the article has many valid points about say, capitalism and the need for unions, but makes some missteps. First off, I absolutely believe that workers today (and particularly millenials) need greater labor protections. Reagan/Thatcher eroded a lot of the ones people fought and died for, and there are too many loopholes in ones we still have (like the 35 hour week). But I'm...uncomfortable with how the author of the millenial burnout piece seems to be taking a systemic problem with capitalism and using the language of disability/chronic illness/neurodivergence to describe it. Apparently it is a terrible thing for me to name that "queer is a slur" is weaponized against queer people speaking about their experiences, so I must be told repeatedly that actually, queer is a slur. You know that is just...grating AF as a queer person. Can we talk about this? I get that not everybody likes the same language. See the differences in bi and pan communities over how people feel about identity labels, for one. Obviously, purposefully using the wrong identity label for someone is harmful. But it would be nice if, when I'm talking about queer experiences, I didn't have people jump down my throat with "BUT QUEER IS A SLUR"
"Oh but students who have trouble writing by hand can get accommodations via disability services--"
What I hear is "it's okay if you dehydrate if it's for the greater good"
Disabled people are not burdens. If you ASK disabled people, we could maybe work together on lifehacks to save the planet that don't limit our access to hydration. 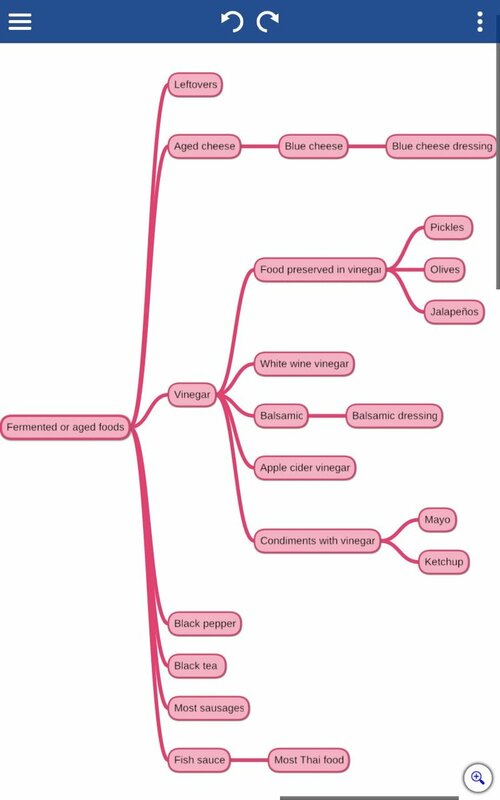 This is part of the fermented/Aged Food branch. One intolerance has a cascade effect on other foods. 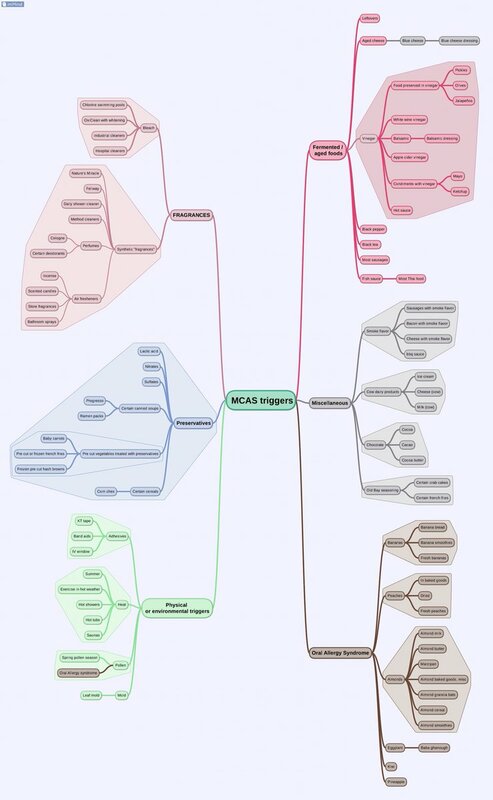 This mind map thing is really helping me process some feels and I think also it's less "here's my huge list of food intolerances" more "a few categories that have many sub categories"
Help with captioning is appreciated. I don't want to yell at people when they offer alternatives to plastic straws, because i know the impulse is good. but I need people to know that "what about ____ straws?" has joined "have you tried yoga?" in terms of emotional labor and irritation. It feels like maybe people think disabled people did not research or discuss alternatives to plastic straws before engaging in a protracted, exhausting campaign for "opt in for plastic straws" instead of a straw ban. See? We have a chart. when you actually try to pin down what some sort of inherent "intelligence" is vs "has learned some stuff, addresses ignorance"
there's a wealth of scholarship about how IQ and the SATs are better indicators of "having privilege" than "being intelligent"
I'm always afraid that if I mention, "Hey actually, sometimes I like meditation, just not as a substitute for medical care that I also need"
2) able people will be all "oh so I CAN say it"
I also don't want to be that one disabled person able people cite as "my disabled friend with chronic pain, who doesn't use opiates"
If you are at a Pride event and you see what looks like a m/f couple, and you feel the urge to complain about "straight people ruining Pride"
You know how we all complain about how ridiculous bathroom bills are, and especially doing ID checks at the door? No matter how good your gaydar, YOU DON'T KNOW who is queer by looking, so don't be the North Carolina of Pride. K? We remember what this was like, yes, fellow people who are out and loud and proud? So let's not make snide comments about "straight people ruining Pride"
Because YOU DON'T KNOW if maybe that person is Questioning.